"In Texas universities' football suites, booze, catering — and politicians of all stripes" was first published by The Texas Tribune, a nonprofit, nonpartisan media organization that informs Texans — and engages with them — about public policy, politics, government and statewide issues. In this time of divisive rhetoric and bitter partisanship, there is still a place where Texas officials of all political stripes can come together. It's not the pink-domed Capitol nor the Governor's Mansion. It's not the decorous Senate floor. And, though it too features a kind of scoreboard that lights up, it's not the House chamber, either. It's kickoff time at a college football game. 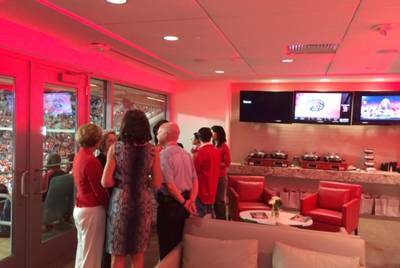 Location: The exclusive stadium suites where chancellors and university presidents play host. On certain fall Saturdays, the invitation-only boxes set aside for Texas A&M University System Chancellor John Sharp and his peers often become small political hotspots, drawing a cast of area politicians, state officials, alumni and big-money donors. Over the last three years, Gov. Greg Abbott, Attorney General Ken Paxton and outgoing House Speaker Joe Straus have all made appearances on university leaders’ guest lists — alongside mayors, local judges, members of the state’s Higher Education Coordinating Board and executives from major corporations. Also invited have been politicians from across the ideological spectrum — from liberal mayors, to moderate state representatives, to allies of the influential and ultra-conservative Empower Texans group. When A&M played Prairie View A&M in September 2016, Abbott, state Rep. Dennis Bonnen and Democratic state Sen. Juan "Chuy" Hinojosa were invited to witness the Aggies’ 67-0 win. When the University of Houston took on the University of Oklahoma in 2016, it was Abbott, a half-dozen Democratic lawmakers, and Republican state Rep. John Zerwas, then chair of the House Higher Education Committee, who were accorded invitations. And few game day guest lists have featured more bold-faced names than the University of Texas at Austin’s September face-off with the University of Southern California, when the nearly 100 invitees to President Greg Fenves’ suite included notable alumni like former Secretary of State Rex Tillerson. The view from an A&M suite. Image provided by an attendee. In the state's higher education ecosystem, where decisions are sometimes made in behind-the-scenes deals or closed-door regents' meetings, the lists could seem to offer a glimpse into the relationships that lie beneath. But for those who have attended, visiting a suite is often an occasion to socialize — an experience that’s far from novel for the well-connected or well-off people invited. “It’s nice to see people and briefly catch up, but the game day experience is not particularly special,” said Stuart Stedman, chair of the state’s Higher Education Coordinating Board, whose friends own suites in different stadiums. It’s “important to get the perspective and opinions of educational leaders around the state, but the environment doesn’t really permit deep, focused discussions of issues,” said Stedman, who also purchases season tickets because he prefers watching the games to socializing. “I suppose there is value in meeting someone briefly and exchanging business cards with the intent of getting together for a more substantive discussion at a later date." At A&M and other universities, the suites' costs are not borne by tuition or appropriations. A&M funds the suites with earnings on investment; UT-Austin with donor funds; UH with foundation money. Lawmakers are "welcome in our suite at any time"
Letters go out to lawmakers over the summer. Institutions offer to host the elected officials, include a schedule of games, and instruct the recipient to reach out to request complimentary tickets. “Any member of the Legislature and their guests are welcome in our suite at any time,” Sharp said. “We’re proud to have them, along with leaders from all over the state who are in a position to help our university and our students,” some of whom are always invited. “The more we expose people to our student body, the more willing people are to help us,” he said. 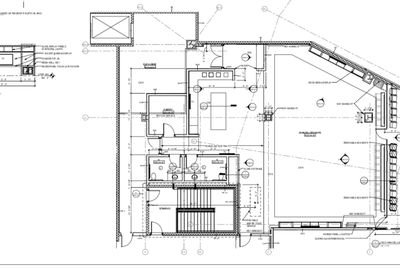 A blueprint for the Texas A&M chancellor's suite, provided through an open records request. His suite, which showcases autographed helmets, now has several televisions, a drink shelf and rows of stadium seating separated with a glass partition. Alcohol is served, and there is buffet-style catering. “I never had anyone complain about the hot dogs, chili, the popcorn or finger food,” Sharp said. At one game, a “12th man dip,” with cowboy caviar and jalapeño bacon, was served. Many people socialize. Lawmakers’ children frequent other university leaders’ suites, as do drop-in visitors from neighboring boxes. Those serious about watching the game claim spots in the rows of stadium seats set off from the food and tables. An avid sports fan, Hance even devised a strategy to ensure he could watch the games undisturbed. "Now, during the half, after the game, I worked the crowd hard," said Hance, who said he would invite donors and top faculty to his suite. Part of the menu for the Texas A&M System chancellor's suite, for a September 2016 game. Of the lawmakers and state officials contacted for this story, many did not respond to a request for comment, or to a request to confirm they had attended specific games. Those who did often said they returned to their alma mater with the intention of watching the game. The governor “obviously enjoys football,” said a spokesperson, who confirmed Abbott has visited suites at the Texas Tech University System and Baylor University, as well as at UT-Austin, UH and A&M. State Sen. Kel Seliger, an Amarillo Republican, has also attended university sporting events across the state, and said he always requests an invoice if he attends. “I don’t want anything free in an area where I'm really active legislatively," said Seliger, who is chair of the Senate Higher Education Committee. "So I just don’t accept free tickets." The governor personally reimburses the cost of his tickets, a spokesperson said; if he has an official role, such as flipping the coin, his campaign will. The Texas Tribune's CEO, Evan Smith, has been invited to UT-Austin's box, as have other media professionals. He requests an invoice for the price of attendance. Under open records laws, the Tribune requested recent guests lists for the suites held by the chancellors of the A&M, UT, UH and Texas Tech systems, and by the presidents of the state’s two most prominent public universities. The Tech system has not yet released information to the Tribune. The system appealed to the attorney general’s office to keep the guest lists confidential, in part, because they include the names of an internal vet school “steering committee.” A&M’s office for open records released guest lists it could locate. Schools in the Texas State University System, headed by another former lawmaker, Brian McCall, do not have suites set aside for use by the chancellor or by regents, a system official said. As state agencies, public university systems cannot spend appropriated money on lobbyists to push their interests with the legislative or executive branches. In turn, lawmakers cannot accept benefits in their official capacity, though there are many exceptions — including for food or entertainment they accept as a guest, and for some benefits conferred by a government entity. In addition, gifts with a value of more than $250 must typically be disclosed on lawmakers’ personal financial statements. But it can be hard to assign a fair market value to access to a chancellor’s suite in part because it’s not an experience generally available for purchase, said Ross Fischer, a lawyer and former member of the Texas Ethics Commission. “A member of the public can't go online and buy a ticket to hang out in the chancellor's box,” he said. The disclosure requirement is similar for appointees, like those that serve on the state’s Higher Education Coordinating Board, which must sign off on new academic programs offered by state universities. A few of the board’s nine members have been invited to watch games from chancellors’ or presidents' suites over the last three years — including at UH, which had plans for a medical school recently approved by the board. A&M and Tech, which are jockeying over whether Tech should be allowed to open a new vet school, have also hosted board members and commissioner Raymund Paredes, as has UT-Austin. Paredes and contacted board members said the invitations have no influence on decisions they make at the agency. “Absolutely not,” said the commissioner, a sentiment echoed by other board members. The interior of a University of Houston suite on a game day. Image provided by an attendee. "Casual atmosphere. Great football and great conversation." University officials say there's an informal and spirited mood in their boxes, and some suggest the suites are used to court or build key relationships, similar to how corporations entertain clients. Meeting with a "prospective donor at a football game can be a major step in cultivating the relationship," a Tech lawyer wrote in a brief to Paxton’s office. J.B. Bird, a UT-Austin spokesperson, said lawmakers are “a fraction of the overall visitors” to the president’s suite, and those who come often already have “strong connections” to the university. “We invite people to the suite who really want to watch the game,” he said. Still, despite the recognizable names on the guests lists, or the dollar amounts behind them, the most noteworthy moments that occur in stadium suites may have little to do with who's present. Take it from Sharp. Though he conceded he rarely has time to watch the plays while entertaining visitors in the suite, he was quick to recall the final score of the most recent game. “Seven overtimes to beat LSU was memorable, to say the least," he said. Disclosure: Texas A&M University, Prairie View A&M University, the Texas Higher Education Coordinating Board, the University of Houston, the Texas Tech University System, Baylor University, the Texas State University System, Brian McCall, Stuart Stedman and Raymund Paredes have been financial supporters of The Texas Tribune, a nonprofit, nonpartisan news organization that is funded in part by donations from members, foundations and corporate sponsors. Financial supporters play no role in the Tribune's journalism. Find a complete list of them here. In Texas universities' football suites, booze, catering — and politicians of all stripes By Shannon Najmabadi December 10, 2018 In this time of divisive rhetoric and bitter partisanship, there is still a place where Texas officials of all political stripes can come together. It's not the pink-domed Capitol nor the Governor's Mansion. It's not the decorous Senate floor. And, though it too features a kind of scoreboard that lights up, it's not the House chamber, either. It's kickoff time at a college football game. Location: The exclusive stadium suites where chancellors and university presidents play host. On certain fall Saturdays, the invitation-only boxes set aside for Texas A&M; University System Chancellor John Sharp and his peers often become small political hotspots, drawing a cast of area politicians, state officials, alumni and big-money donors. “Some people ask to come,” said Sharp, a former Democratic lawmaker. “We try to invite people who have been helpful — or whom we think can be helpful — to Texas A&M; and our students.” Over the last three years, Gov. Greg Abbott, Attorney General Ken Paxton and outgoing House Speaker Joe Straus have all made appearances on university leaders’ guest lists — alongside mayors, local judges, members of the state’s Higher Education Coordinating Board and executives from major corporations. Also invited have been politicians from across the ideological spectrum — from liberal mayors, to moderate state representatives, to allies of the influential and ultra-conservative Empower Texans group. When A&M; played Prairie View A&M; in September 2016, Abbott, state Rep. Dennis Bonnen and Democratic state Sen. Juan "Chuy" Hinojosa were invited to witness the Aggies’ 67-0 win. 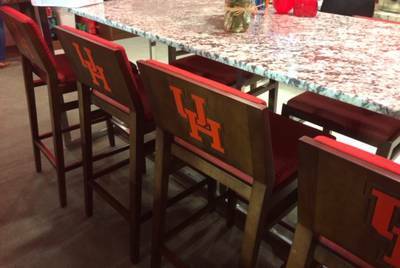 When the University of Houston took on the University of Oklahoma in 2016, it was Abbott, a half-dozen Democratic lawmakers, and Republican state Rep. John Zerwas, then chair of the House Higher Education Committee, who were accorded invitations. And few game day guest lists have featured more bold-faced names than the University of Texas at Austin’s September face-off with the University of Southern California, when the nearly 100 invitees to President Greg Fenves’ suite included notable alumni like former Secretary of State Rex Tillerson. The view from an A&M; suite. Image provided by an attendee. In the state's higher education ecosystem, where decisions are sometimes made in behind-the-scenes deals or closed-door regents' meetings, the lists could seem to offer a glimpse into the relationships that lie beneath. But for those who have attended, visiting a suite is often an occasion to socialize — an experience that’s far from novel for the well-connected or well-off people invited. “It’s nice to see people and briefly catch up, but the game day experience is not particularly special,” said Stuart Stedman, chair of the state’s Higher Education Coordinating Board, whose friends own suites in different stadiums. It’s “important to get the perspective and opinions of educational leaders around the state, but the environment doesn’t really permit deep, focused discussions of issues,” said Stedman, who also purchases season tickets because he prefers watching the games to socializing. “I suppose there is value in meeting someone briefly and exchanging business cards with the intent of getting together for a more substantive discussion at a later date." At A&M; and other universities, the suites' costs are not borne by tuition or appropriations. A&M; funds the suites with earnings on investment; UT-Austin with donor funds; UH with foundation money. Lawmakers are "welcome in our suite at any time" Letters go out to lawmakers over the summer. Institutions offer to host the elected officials, include a schedule of games, and instruct the recipient to reach out to request complimentary tickets. “Any member of the Legislature and their guests are welcome in our suite at any time,” Sharp said. “We’re proud to have them, along with leaders from all over the state who are in a position to help our university and our students,” some of whom are always invited. “The more we expose people to our student body, the more willing people are to help us,” he said. 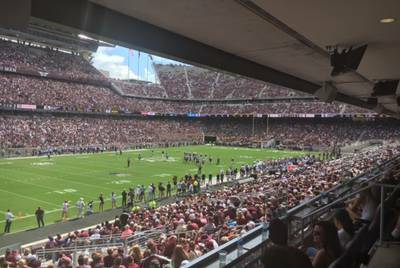 A&M;’s football stadium was renovated between 2013 and 2015, a $484-million enterprise completed $1 million under budget. The chancellor’s box was moved then from the 50-yard line to the corner of the end zone, and the desirable mid-field real estate opened to private use for “tens of millions of dollars,” Sharp said — “to help our university and student body.” A blueprint for the Texas A&M; chancellor's suite, provided through an open records request. His suite, which showcases autographed helmets, now has several televisions, a drink shelf and rows of stadium seating separated with a glass partition. Alcohol is served, and there is buffet-style catering. “I never had anyone complain about the hot dogs, chili, the popcorn or finger food,” Sharp said. At one game, a “12th man dip,” with cowboy caviar and jalapeño bacon, was served. Many people socialize. Lawmakers’ children frequent other university leaders’ suites, as do drop-in visitors from neighboring boxes. Those serious about watching the game claim spots in the rows of stadium seats set off from the food and tables. “I love football and basketball,” said Kent Hance, a former U.S. congressman and chancellor of the Texas Tech University System. Hance’s suite at Tech had retractable glass doors so when seated, “you get the feel of being there in the game.” “Some stadiums just have solid glass,” he said. “I don't like that because you don’t get a feel — you don’t hear the crowd yelling, you just don’t get to be part of the game.” An avid sports fan, Hance even devised a strategy to ensure he could watch the games undisturbed. “I would go sit in my seat and I would have two college students stand on the ends of the row so somebody couldn’t get down there,” he said. If a visitor came by to greet Hance, the students would say, “Well, he’ll really want to talk to you at the half or after the game,” he said. “That was their job.” "Now, during the half, after the game, I worked the crowd hard," said Hance, who said he would invite donors and top faculty to his suite. 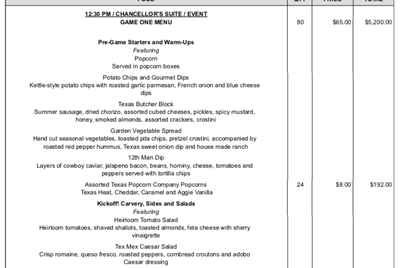 Part of the menu for the Texas A&M; System chancellor's suite, for a September 2016 game. The governor “obviously enjoys football” Of the lawmakers and state officials contacted for this story, many did not respond to a request for comment, or to a request to confirm they had attended specific games. Those who did often said they returned to their alma mater with the intention of watching the game. The governor “obviously enjoys football,” said a spokesperson, who confirmed Abbott has visited suites at the Texas Tech University System and Baylor University, as well as at UT-Austin, UH and A&M. ; State Sen. Kel Seliger, an Amarillo Republican, has also attended university sporting events across the state, and said he always requests an invoice if he attends. “I don’t want anything free in an area where I'm really active legislatively," said Seliger, who is chair of the Senate Higher Education Committee. "So I just don’t accept free tickets." The governor personally reimburses the cost of his tickets, a spokesperson said; if he has an official role, such as flipping the coin, his campaign will. The Texas Tribune's CEO, Evan Smith, has been invited to UT-Austin's box, as have other media professionals. He requests an invoice for the price of attendance. Under open records laws, the Tribune requested recent guests lists for the suites held by the chancellors of the A&M;, UT, UH and Texas Tech systems, and by the presidents of the state’s two most prominent public universities. The Tech system has not yet released information to the Tribune. The system appealed to the attorney general’s office to keep the guest lists confidential, in part, because they include the names of an internal vet school “steering committee.” A&M;’s office for open records released guest lists it could locate. Schools in the Texas State University System, headed by another former lawmaker, Brian McCall, do not have suites set aside for use by the chancellor or by regents, a system official said. As state agencies, public university systems cannot spend appropriated money on lobbyists to push their interests with the legislative or executive branches. In turn, lawmakers cannot accept benefits in their official capacity, though there are many exceptions — including for food or entertainment they accept as a guest, and for some benefits conferred by a government entity. In addition, gifts with a value of more than $250 must typically be disclosed on lawmakers’ personal financial statements. But it can be hard to assign a fair market value to access to a chancellor’s suite in part because it’s not an experience generally available for purchase, said Ross Fischer, a lawyer and former member of the Texas Ethics Commission. “A member of the public can't go online and buy a ticket to hang out in the chancellor's box,” he said. The disclosure requirement is similar for appointees, like those that serve on the state’s Higher Education Coordinating Board, which must sign off on new academic programs offered by state universities. A few of the board’s nine members have been invited to watch games from chancellors’ or presidents' suites over the last three years — including at UH, which had plans for a medical school recently approved by the board. A&M; and Tech, which are jockeying over whether Tech should be allowed to open a new vet school, have also hosted board members and commissioner Raymund Paredes, as has UT-Austin. Paredes and contacted board members said the invitations have no influence on decisions they make at the agency. “Absolutely not,” said the commissioner, a sentiment echoed by other board members. The interior of a University of Houston suite on a game day. Image provided by an attendee. The interior of a University of Houston suite on a game day. Image provided by an attendee. "Casual atmosphere. Great football and great conversation." University officials say there's an informal and spirited mood in their boxes, and some suggest the suites are used to court or build key relationships, similar to how corporations entertain clients. Meeting with a "prospective donor at a football game can be a major step in cultivating the relationship," a Tech lawyer wrote in a brief to Paxton’s office. “Casual atmosphere. Great football and great conversation,” UH spokesperson Mike Rosen said of Renu Khator's suite. “But the president’s attention is highly focused on the game. She takes it seriously.” J.B. Bird, a UT-Austin spokesperson, said lawmakers are “a fraction of the overall visitors” to the president’s suite, and those who come often already have “strong connections” to the university. “We invite people to the suite who really want to watch the game,” he said. Still, despite the recognizable names on the guests lists, or the dollar amounts behind them, the most noteworthy moments that occur in stadium suites may have little to do with who's present. Take it from Sharp. Though he conceded he rarely has time to watch the plays while entertaining visitors in the suite, he was quick to recall the final score of the most recent game. “Seven overtimes to beat LSU was memorable, to say the least," he said. Disclosure: Texas A&M; University, Prairie View A&M; University, the Texas Higher Education Coordinating Board, the University of Houston, the Texas Tech University System, Baylor University, the Texas State University System, Brian McCall, Stuart Stedman and Raymund Paredes have been financial supporters of The Texas Tribune, a nonprofit, nonpartisan news organization that is funded in part by donations from members, foundations and corporate sponsors. Financial supporters play no role in the Tribune's journalism. Find a complete list of them here. Read related Tribune coverage State lawmaker files bill to require annual football game between UT and Texas A&M; UT regents approve $175 million upgrade to Longhorns' football stadium Ballpark Figures: Look at the finances of some of Texas’ biggest college athletic programs "In Texas universities' football suites, booze, catering — and politicians of all stripes" was first published at by The Texas Tribune, a nonprofit, nonpartisan media organization that informs Texans — and engages with them — about public policy, politics, government and statewide issues. Link back to the original article, which is located at https://www.texastribune.org/2018/12/10/texas-chancellors-football-suites-politicians-all-stripes-mix/.